Talking of water; I'd watch your glove next time, see Dan's Nomad thread Grin. No worries, Chris; a good cautionary tale to avoid glove-boating! schwalble kojak's or supreams totally change the feel of the bike max pressure. 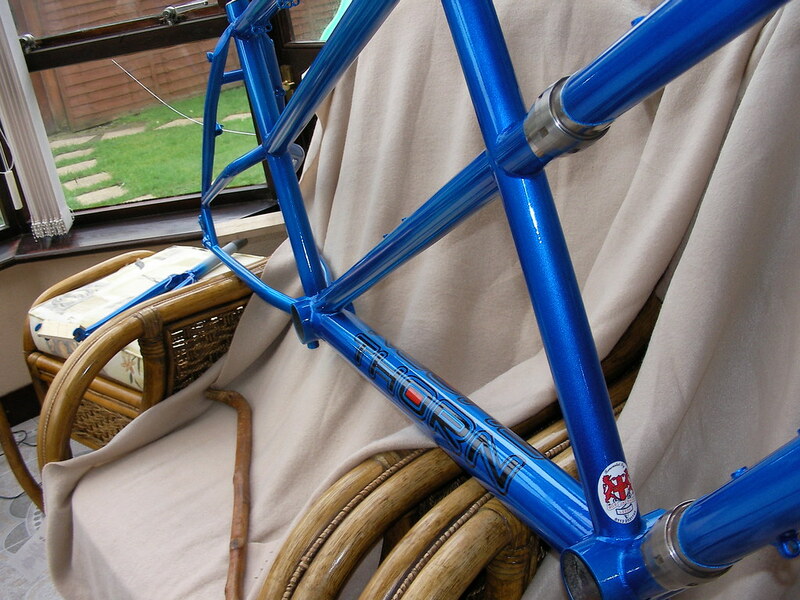 In the photo’s the Audax is shod with good old Panaracer Pasela’s folding version in the 28 width. These have been terrific, very comfortable and superb winter grip. However I’ve had problems with the sidewalls of these tyres, they are very prone to splitting. I also run these tyres in 26x1.5 and 26x1.75 on other bikes with no problems at all. Take a look on the CTC forum where the repeated failures of 700x28 Pasela’s had been extensively discussed. 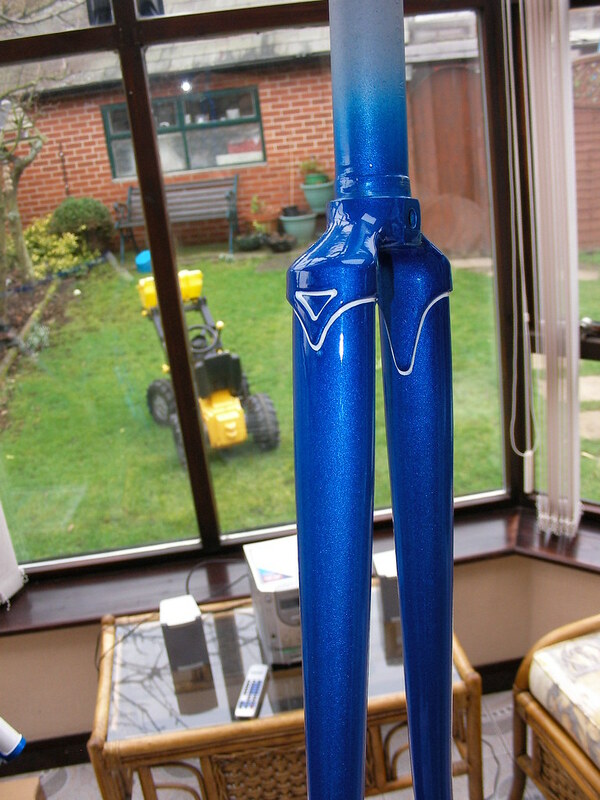 I’m now trying Vittoria Rubino Pro Folding, again 28’s (not available at SJS so used Ribble). So far I’m not too sure about these, I’ve had a fall and a few slide’s on frosty or wet roads which I’m pretty sure would not have happened with the Pasela’s. I’ll stick with the Rubino’s for now but I’m not sure what to do next winter, while I love the ride on the Pasela’s I’m not paying that sort of money for a tyre that fails so frequently. It is a Pasela made with extra care, and perhaps the sidewall issue has been resolved. it'd be awfully expensive to find out if it hasn't. I have the Grand Bois Cerfs 29 mm and love them. Previously I rode 28 mm Gator skins and the Cerfs are so much better. Much more comfortable, smoother and I think faster. They are expensive though. I have a pair of 32mm (says 30mm on the packet) waiting for the Club Tour when it arrives!!! ah steve you've gotta post a photo,when ever i get my club tour hopefully in the next few months ,it will be decked in a set of those grand bios.i always rode tubs when i could go fast ::)and they reckon the grand bios is every bit as good as the best tubs great grip even on wet tarmac and fast. It seems that nobody who has taken the plunge and forked out for a set of Grand Bois tyres regrets it, the reputation is superb. I am never the less quite put off by the price. One other thing too; cleaning. Amber walled tyres are a blooming nightmare to clean. Well, I arrived home last night after the wife and kids were all fast asleep to fined a large bike box in the house. So here they are. The finish on both bikes is superb but I'm espesialy impresed with the Audax. I'll have a photo of the Audax rebuilt by the end of the weekend, might take me a bit longer to have get the Raven Twin done though. Oh WOW that is a fantastic bit of painting really class job he even lined it as well very tasty. exactly what colour is that can i ask how much for the audax. anyway enjoy you certainly have the best looking bike ive seen in years love it. Not cheep. £450 for them both, that including all the work plus freight costs. I don't have a full breakdown of the various charges however as you can see more has been spent on the Audax. 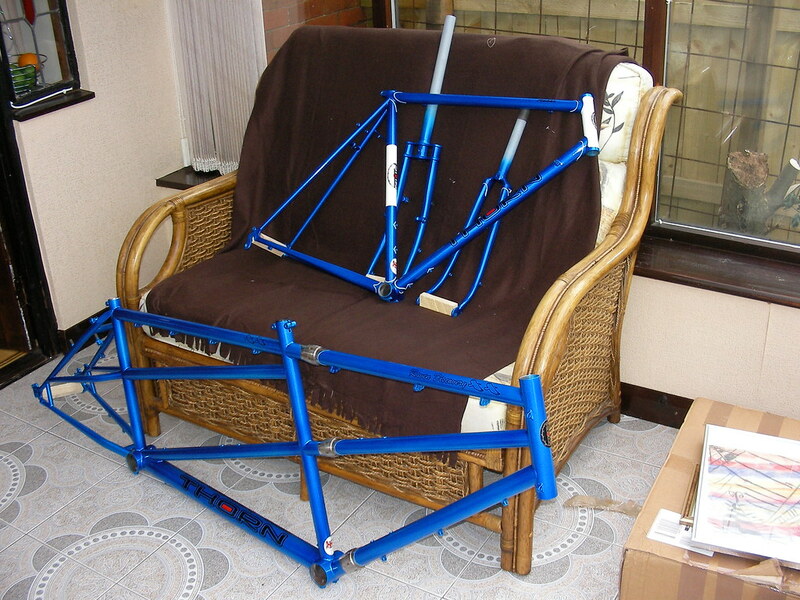 Worth it though, both frames needed re-preservation, in the case of the bottom brackets on the tandem quite urgently. I love the job done on the Audax, I now have something quite unique with a finish that I'm confident will last through quite a number of winters. The wife's due home from work at around 1530 so at that point I might go and get started in the garage. The colour is Flambouyant Petrol Blue. 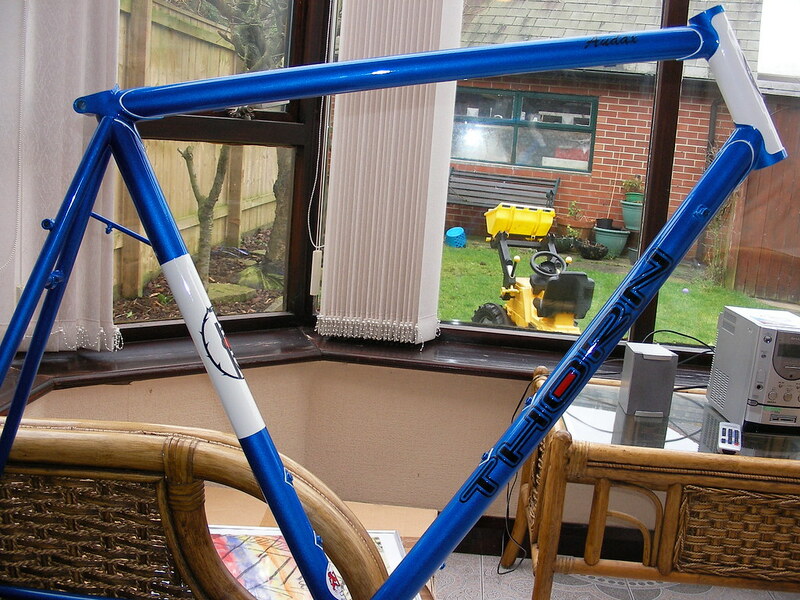 Your Audax is just looking fantastic Joe, it is worth every penny to get a nice steel frame with lugs properly renovated. I'm sure you'll have a massive smile on your face riding the Audax for many years to come, congratulations. They both looks stunning Joe, I particularly like the colours on your Audax, very stylish and tasteful, it will never date. 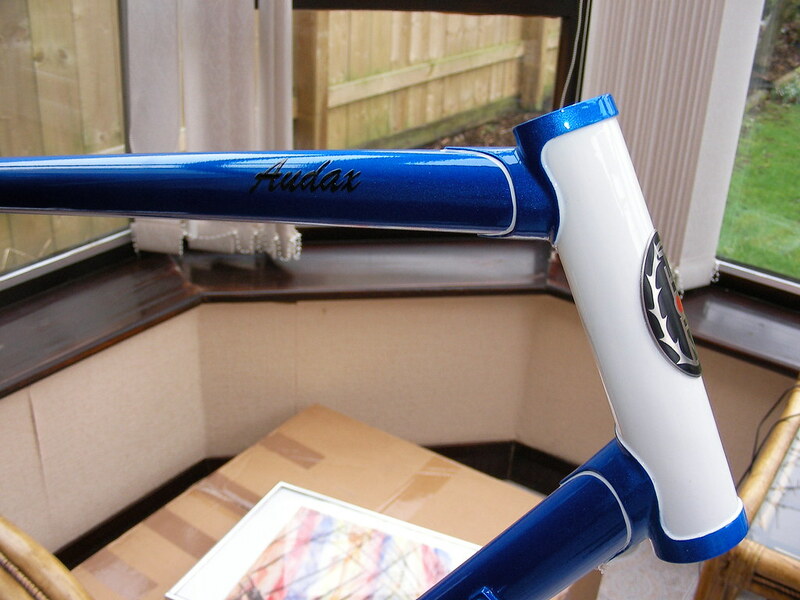 Considering you bought your Audax at a great price I think you've still grabbed a bargain considering the price of a brand new one even after the cost of that beautiful respray.